I came for the flannel, but I stayed for Harriett. I didn’t see this book in 1977, but I’m glad I found it now. 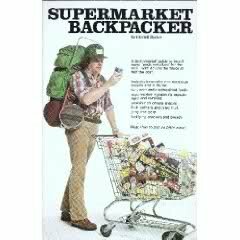 I bought a used copy of Supermarket Backpacker by Harriett Barker and I love it. This sentence starting at the bottom of page one may be the truest thing ever written in a cookbook: “Don’t forget that water is the only thing you can cook really well when backpacking in the high mountains.” I have proved that it is true in the flatlands, too. Ask the other members of the Raccoon Patrol. For the perfect icing on the cake, a friend wrote haiku for each chapter. Also, lovely pen and ink illustrations from two other friends. We should all be so lucky in our friends. This book has a huge amount of information. Brand names, vegetarian meals, kosher meals, a Mexican sopa seca recipe. You could camp for years on just this cookbook. A good rule to follow when making any leather…if it tastes good in the blender, it will taste twice as good at camp. Before drying, sample and make additions until the combination pleases you. There is only one thing that makes me sad from this book. 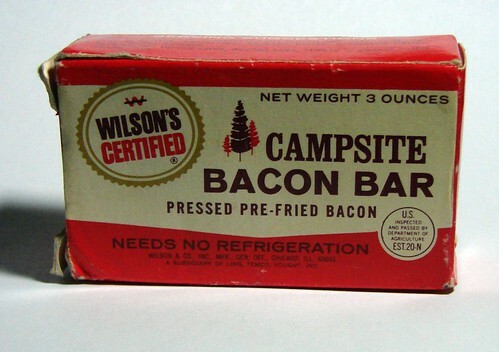 We can no longer buy a Wilson’s bacon bar. Dang, I miss those. This entry was posted in Backpacking & Hiking, Books, Food & Cooking. Bookmark the permalink.